4-Valve test and charging manifold provides the flow that's proven faster than any conventional manifold. The aluminum alloy body is forged for strength and reliability with 3/8" bores through the body to speed the job. Heavy duty hook won’t pull out. 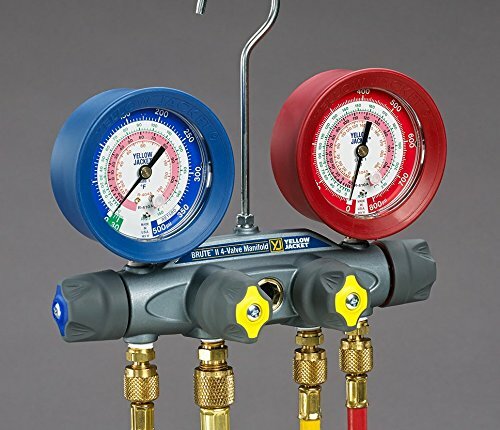 Also available with 3-1/2" (90 mm) red and blue liquid-filled gauges. Fourth hose enables connection to hi-/lo-sides, refrigerant tank and recovery unit or vacuum pump for diagnostics, evacuation and charging without switching hoses. Available in 1/4" hi-/lo-sides with 3/8" vacuum port for regular jobs, or 3/8" hi-/lo-sides with 1/2" vacuum port for larger systems. If you have any questions about this product by Yellow Jacket, contact us by completing and submitting the form below. If you are looking for a specif part number, please include it with your message.